This is the year of redesigns, and the 2019 Chevrolet Equinox received a huge upgrade with some improvements that will definitely make it a contender during your SUV search. It has a great interior with plenty of standard features, which makes it hard to choose between trims. Our trim comparison can help with that, however. The 2019 Chevrolet Equinox L is the base trim and starts at $24,995. Standard offerings for this trim are front-wheel drive and a 1.5 turbo engine that’s capable of 170 horsepower and 203 lb-ft of torque. What makes the Equinox exceptional is the fact that it comes with Chevrolet MyLink, which includes Bluetooth streaming audio, voice-activated technology, Apple CarPlay, and Android Auto. If you’re worried about safety, the Equinox L comes with a few basic features that make all the difference, including rear vision camera and StabiliTrak. This electronic stability control system helps you during low-traction conditions. Additionally, it has Teen Driver mode to keep your kids distraction-free when you aren't around. Finally, it comes with a host of OnStar features including Crisis Assist, emergency services, hands-free calling, stolen vehicle assistance, and more. The LS trim starts at $26,995 and comes with a couple of extras that may be worth the extra cost. With your purchase, you’ll find carpeted floor mats for the whole vehicle and a spare tire for emergency situations. Choosing this trim also opens up options for additional package add-ons, something that is unavailable on the previous L trim. For some, these are important additions to protect the vehicle against all types of situations from mud to a blowout. For the final two trims, the LT and the Premier, Chevy offers 3 different engine options: the traditional 1.5-liter turbo, a larger 2.0-liter turbo, and a 1.6-liter turbo diesel. Each engine option does include a few specific cosmetic extras that distinguish it from the other trim options, as well. The LT 1.5L Turbo starts at $28,295 and is worth the upgrade. It has everything the LS has plus a few more features that set it apart. This model features high-intensity discharge headlamps, a power driver seat with driver lumbar support, multi-color driver information display, and outside heated power-adjustable, manual-folding mirrors featuring body color caps. The diesel LT model starts at $30,695. It has the same high-intensity discharge headlamps and interior features as the 1.5L turbo, but the real gamechanger is that the diesel engine allows for exceptional fuel economy. The 28 mpg in the city and 39 mpg on the highway are the best fuel economy numbers in its class (tied for first with its GMC Terrain diesel cousin). In fact, it has the second-best fuel economy of any non-hybrid SUV, only just being edged out by the subcompact Nissan Kicks. That's quite an accomplishment for a larger vehicle. The Equinox LT 2.0L Turbo has a starting MSRP of $30,795. The upgraded engine features continuously variable valve timing, direct injection and start/stop technology, all with a 9-speed automatic transmission. The trim model also features 18" aluminum wheels and chromed dual exhaust on the exterior. Like the LT trim, buyers can also select between three engine options at the Premier trim level. There are, however, few differences between them when it comes to comfort and technology features. The main differences are the prices for the engine types. The Premier 1.5L Turbo starts at $32,195, while the Primer 1.6L Turbo Diesel will set buyers back about $34,395. Lastly, the Premier 2.0L Turbo is just a hair more expensive than the diesel at $34,995. Some of the best highlights of the Premier offerings include heated seating for front passengers during those extra cold days. Heated rear seats are also optional. You also have the option to pay more for ventilated seating for all passengers, helpful during summer days. Plus, this trim is the only one that has dual-zone automatic air conditioning that monitors cabin conditions to keep it comfortable for the driver and front passenger. On the inside, you can access your applications on a larger eight-inch diagonal color touchscreen and charge your phone using the USB dual ports located in the center stack storage bin. Two more USB ports in the front console bin mean that you can charge four devices at the same time. For other drivers, the upgraded safety features may draw them toward the Premier trim. It comes with Lane Change Alerts with Side Blind Zone Alerts, Rear Cross-Traffic Alerts, and Rear Park Assist. 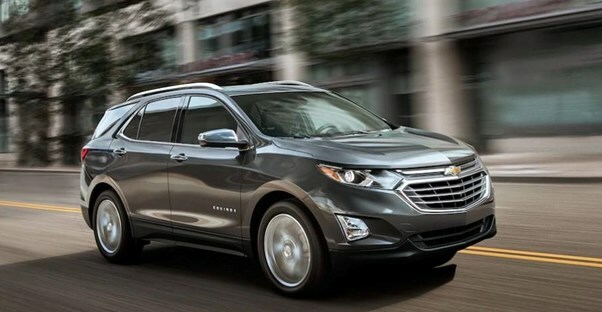 Overall, this can help you keep your 2019 Chevrolet Equinox safer while on the road. Minivan vs. SUV: Which Is Best for Your Family?